I've seen hundreds of pictures of Lou Gehrig. Of him swinging, catching, posing, fishing, smiling. 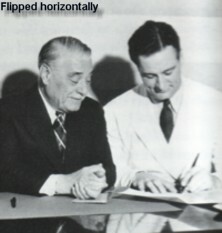 A short time ago I was looking at a picture of Gehrig signing a Yankee contract, with Colonel Ruppert sitting beside him. As sometimes happens, I was spacing out, subconsciously studying the inner depths of the picture. Perhaps I fell asleep with the image of Gehrig laying down his slow, calculated, perfect signature on that piece of paper. Perhaps I was awake the whole time. In either scenario, I suddenly had one of those ohm'god moments that brings you back to real time. I looked away from the picture, then at it again, just to be sure I was seeing it correctly. If you look closely at the picture, you too will notice the ohm'god (feel free to space out). Hint: he batted and threw left-handed. Ohm'god, he's writing with his right hand. Immediately I flipped through all my Gehrig pictures, searching for ones of him writing. Sure enough, every one of them showed him with a pen in his right hand. With a little aid (shout-out to J. ), I was able to come up with three theories to explain this oddity. And here they are. Ambiwho? Ambidexterity is the ability to use both hands equally; it is a rare talent. To back up this theory, I had to find instances in which Gehrig displayed right-handed tendencies. I found some. He wore his belt with the buckle pointing right and his watch on his left wrist. There is also a picture of him fixing his fishing rod with his right hand. Granted not all right-handers wear their belts and watches as shown, but most do. Seems convincing, right? The ambidextrous theory has a huge flaw: Gehrig was not a switch hitter. For a man so dedicated to helping his team any way possible and increasing his dominance over pitchers, he would have certainly moved between the boxes had he been equally talented in both. Back in the day, some cameras took pictures that were the horizontal opposite of the real thing. This would make the printed picture appear natural, though the picture displayed the "flipped" version of reality. The makers of Pride of the Yankees (the first Gehrig biographical film) used the flipping technique to make the right-handed Gary Cooper, who played Gehrig, appear left-handed in the finished movie. So, in short, this theory contends that photographers who took pictures of Gehrig writing with his left hand had cameras that flipped the image so that the picture printed in newspapers showed him writing with his right. As with the previous theory, the flipped-picture theory is imperfect. Three huge, gaping bullet holes kill it. First, it implies that there was a mass conspiracy. I have seen 5 pictures of Gehrig writing, all taken in different years, in different settings, and by different people, but all showing him scrawling rightie. Second, though the Pride of the Yankees detail may at first appear to support the theory, it's about as strong as a fly's wing. The wardrobe folks for the movie made special uniforms, hats, etc., on which any emblems and writing was stitched backwards so that when the film was shown on the big screen, everything would look normal. Any shots of Cooper at first base were actually filmed at third base. So even if the Gehrig photographers used cameras that flipped pictures, they would then have the problem of details appearing obviously backwards. Which brings me to the final flaw of this theory: no details of the pictures appear obviously backwards. 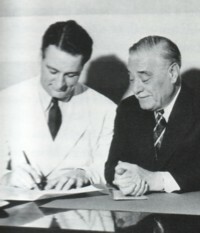 To illustrate, take another look at the picture of Gehrig signing a Yankee contract. Next to this picture I have supplied the "flipped" version. Watch Gehrig's hair part. 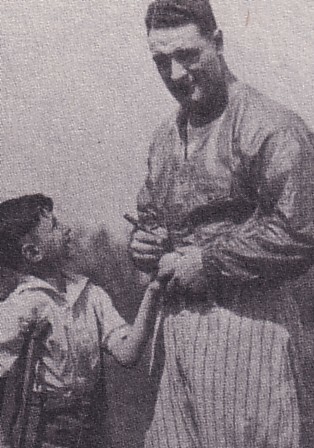 Proven by many pictures of him throughout his life, Gehrig's part was on the right side of his head. If the picture was flipped, his part would be on the left side of his head. Theory 3: Lou Gehrig was a Victim of "Correction"
The practice of "correcting" left-handed children was quite common in past generations. 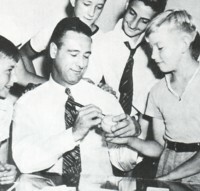 When Gehrig was growing up, it was acceptable for teachers to force left-handed children to write right-handed. In many cultures in every era, "left" has negative connotations. For example, in certain countries on the Asian continent people use their left hands to wipe themselves after nature's call. "Right," conversely, carries positive vibes mainly because the majority of the world is right-handed. Lefties are expected to adapt, their needs are by far neglected, and, for the most part, they end up being more dexterous than righties. Scissors, spiral-bound notebooks, guitars, and video cameras are among everyday stuff designed by and meant for people who favor their right hands. Considering all of this, it is highly probable that Gehrig's grade school teachers moved his pen to his right hand (Gerhig always did what authority figures wanted him to do). This certainly explains why he wrote right-handed and wore his watch on his left wrist (so as to not get in the way when writing) while he did virtually everything else as a south paw. If I ever place a bet on why Gehrig wrote rightie, my money would be with Theory 3, "correction."